There seems to be some confusion about the overlap between poverty and employment in the wake of last week's Household Below Average Income statistics. Full Fact http://fullfact.org/factchecks/are_the_majority_of_children_poor_workles... states :'some commentators claim that, contrary to popular wisdom, the majority of poor households actually contain at least one adult who is in work.' and asks 'Is this true?' They mention Polly Toynbee and Owen Jones specifically and go on to suggest that things are not so clear cut. I hate to disagree with Full Fact, which is generally very good at holding the press and politicians to account for their use of statistical evidence, but in this case they're just wrong. Things couldn't really be much more clear cut. Apart from pensioner poverty,the majority of UK poverty is in-work poverty. But first there's a confusion to clear up. The unit of analysis in HBAI isn't households: it's individuals. If all households were the same size and had identical structures this wouldn't matter. They don't, so it does. Consider for example that poverty rates tend to be higher for families with more children. There is no reason to expect the percentage of poor children who are in large families to be the same as the percentage of poor families which are (also) large families. HBAI gives data on the former, not the latter. The confusion arises because incomes are measured at the household level, with adjustment for household size and composition. If one individual in a household is in poverty on this measure, all are: all poor kids have poor parents, for example. But it's the kids rather than the households that are being counted. So it would be wrong to say that HBAI shows that 'the majority of poor households actually contain at least one adult who is in work', because HBAI doesn't really show anything about households per se. The quotation from Owen Jones does seem to get this confused - he says 'more working families are classed as poor than those with no one in work'. If Full Fact were criticising him for confusing individual- and household-level data, that would be legitimate if somewhat over-pedantic. But Full Fact go on to make exactly the same mistake themselves, with a series of charts mislabelled as if the data referred to households rather than individuals. 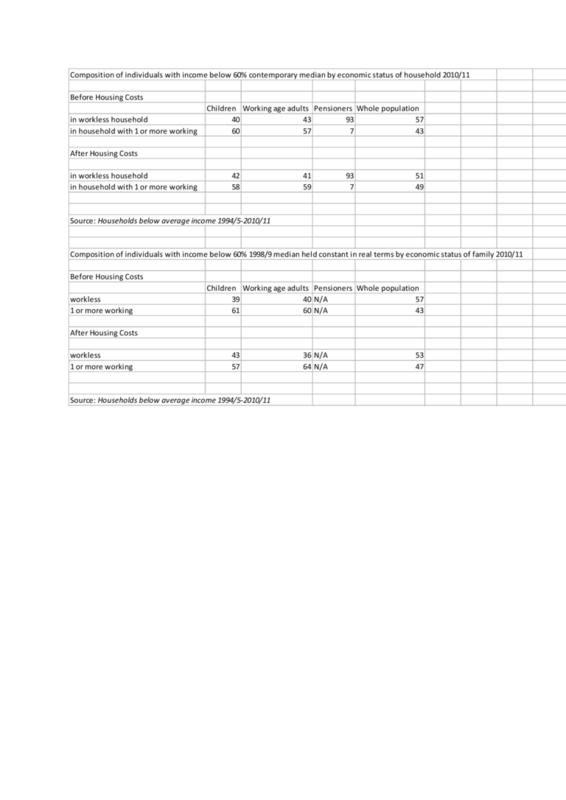 The statistics from HBAI are in the attached spreadsheet. The standard, internationally accepted poverty definition is 60% median contemporary household income adjusted for household size and composition. In the UK, this is presented Before and After Housing Costs, BHC and AHC in the jargon. In what follows, BHC comes first. 60/58% of children in poverty are in households where one or more of the adults are working, and 57/59% of working age adults in poverty. (I don't know where Full Fact's figures for working age adults come from, but they aren't the ones in table 5.4db of HBAI, which is the source). Not much ambiguity there. Full Fact confuse matters by giving data for the whole population in poverty split by whether in working or workless households (adding further confusion by mislabelling the chart) without making the obvious point that most pensioners in poverty are in workless households: it is hardly surprising if once we include pensioners the majority of people in poverty are in households where nobody is working. But as Owen and Polly were quite clearly referring to people of working age and children, they can't be faulted on this count. Full Fact conclude 'Readers would be well advised not to take claims about workless households in poverty at face-value.' As the terms 'workless', 'household' and 'poverty' are routinely mis-used by politicians and commentators I can't disagree, but I'm afraid all they have done is shed confusion on one of the clearer aspects of child and working age poverty in contemporary Britain. Where's the fairness in this?